Jeff Kocsis’ “Still United” section is now online! It looks like United have decided it’s time to drop their “Still United” DVD online for your viewing pleasure! THey’re kicking things off with Jeff Kocsis‘ section that’s packed full of amazing riding and a bunch of laughs for good measure. This is too good to pass up, so get on that play button and enjoy! “The Jersey Boy! We’ve been fans of this guy for years ever since he blessed the pages of DIG Magazine with his all black bike setup and East Coast chiller style. Watching Jeff Kocsis build his Still United section piece by piece was a pleasure and I’m sure you’ll agree he makes everything he does look just so. And you can’t beat that level of jive talk with many people – he’s your man for a hilarious time on the road. Animal Bikes have released another section from their “FACTS” video online for your viewing pleasure. This time we get the team mix section, along with Ryan Howard‘s section for you to check out. This one is stacked, so you know there’s plenty of dialed riding to see. Take a look! If you want, you can check out the Full “FACTS” video here! Mix section clips from Augie Simoncini, Gabe Brooks, Anthony DeRosa, Abdul Fofanah, Jeff Kocsis, Ben Lewis, and Courage Adams. Almost a year since the United full-length video “Still United” has been released and there is still more to see! Here’s a raw cut from Jeff Kocsis‘ footage from the video that didn’t make it into the final video. As you can imagine, even though this was leftovers, the footage is still damn good by anyones standard! Check it out! “We are huge fans of Still United at DIG so we’re real psyched on this series of raw bonus, unseen and behind-the-scenes footage from the DVD. We’ll have one of these dropping every Wednesday through February and March so keep your eyes peeled. First up is none other than New Jersey OG Jeff Kocsis. Gotta love that style! Animal Bikes coming through with a new video featuring Jeff Kocsis putting his new signature Kocsis Grips to good use out in the streets! Hit play to check out some damn good riding mixed with great spots and some clean film work! 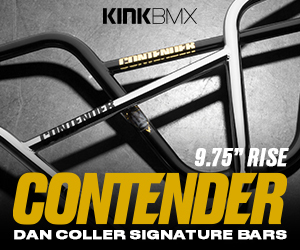 “Jeff Kocsis put together this fire to debut his new signature grip for Animal Bikes. Animal Bikes have released this preview of the new Jeff Kocsis signature grips that will be hitting BMX shops and mail-orders that carry Animal worldwide in September. The Kocsis grip features a classic Mushroom style ribbed pattern with a small band that features an Animal logo, a mid size flange for that happy medium between flangless and full flange and a 160mm length. It also appears to have a cut line making it easy to make it flangless if you prefer that route. The grips will be available in black or Retro gum and come with Animal’s new Sewer Cap bar ends that feature a metal insert to help prevent them from breaking as easily. So, if you’re on the hunt for a new set of soft grips, these might just be what you’re looking for!